- Plan on finishing up Developmental Testing of the systems including EMALS, AAG and the Dual-Band-Radar by the summer-autumn of 2018 with Operational Test and Evaluation on the ship using operational crews currently scheduled to begin in the October-November 2018 timeframe. - Currently looking into moving Shock Trials to the second ship, allowing Ford to go on her first deployment by mid-late 2020. Otherwise add 6 or so months for FSST and subsequent reporting-->clearances etc. - First ship ONLY one to have the SPY-3/4 Dual-Band Radar (X and S band GaAs AESA antennas with common processing and back end). All subsequent ships to be fitted with the EASR (S-Band GaN AESA). [ EASR is a shrunk down version of the AMDR-S or SPY-6. Eventually plan is to compete an AMDR-X and it is assumed that there will be an EASR-X also a shrunken down version of AMDR-X]. - No regulatory limit exist for testing/using EMALS when in port. This is different from legacy carriers where regulations (limit on no loads based on environmental impact) did not permit training and testing of the system when in port. - Towards the end, they ID and explain the Vibration issue with SH and heavy external loads during EMALS launch. Fix has been designed, tested and verified and is purely based on software. A more detailed explanation of how the situation was overcome has been posted here earlier. Via SPF. ESSM block II with a new Active RF seeker (still maintains the passive modes of block I using illuminators). Completes interceptor upgrades for bulk of the USN AEGIS and non AEGIS systems. SM3 IIA, SM6, SeaRAM (RAM Block II) and now ESSM-II. Next up is to up an active seeker on legacy SM2s. Most notably, the ESSM Block II also gains capability to intercept Short Range Ballistic Missiles, something that the Block I could not do. Now SoKo want N-subs.Japan too but its constitution forbids it,hence the poor man's N-sub,the Soryu. SEOUL: South Korea is negotiating with the United States to buy nuclear-powered submarines to guard against threats from Pyongyang, local reports said Tuesday, as President Donald Trump said Seoul would buy "billions of dollars" of US weapons. Such a purchase would redraw the balance of power in northeast Asia, and could trigger a regional arms race. Japan -- another US ally -- does not have nuclear-powered submarines, and is barred from having a military under its post-World War II pacifist constitution. And while China's increasingly powerful navy does include them in its fleet, Beijing would undoubtedly be infuriated by any such acquisition by Seoul. After a summit in South Korea with his counterpart Moon Jae-In, Trump on Tuesday said Seoul would be buying a large amount of US weapons "whether it's planes, whether it's missiles, no matter what it is". Multiple South Korean media outlets said the two leaders ordered officials to begin the purchase talks "immediately", citing a senior official who gave an anonymous briefing. "The strategic assets under discussion include a nuclear-powered submarine and a sophisticated surveillance asset," the reports quoted a senior official of Moon's office as saying. "We will have close consultations with the US about these two in the future," the official was quoted as saying. The country is currently barred from developing atomic weapons under the deal with the US, which in turn offers Seoul "nuclear umbrella" against potential attacks by the North. Trump also said the US had agreed to remove a 500 kilogram (1,100 pound) warhead weight limit on Seoul's ballistic missiles. SoKo really does not need N-subs when it has only one principal enemy,NoKo. OK,add China to the list,NoKo's erstwhile chief sponsor.Even here,China is close by and land-based missiles and its current crop of AIP subs can do the biz.perhaps some more may be reqd. to keep a more intense watch on the activities of the PLAN in the region.If it wants to possess a secret UW strat. deterrent,then it should go the Israeli way.Conv. subs armed with N-tipped LRCMs. Will South Korea Build Nuclear Attack Subs? The leaders have reportedly discussed the acquisition of nuclear-powered submarines during their recent summit. U.S. President Donald Trump and his South Korean counterpart, Moon Jae-in, have reportedly discussed the development or procurement of nuclear-powered attack submarines (SSN) for the Republic of Korea (ROK) Navy during a bilateral summit held in Seoul today, according to a ROK government official. While the ROK government official did not provide additional details of the discussion, the fact that president Moon mentioned South Korea’s interest in developing or purchasing nuclear submarines during today’s summit is indicative of the ROK government’s growing desire to acquire a SSN capability in the not too distant future. The primary reason for the Moon administration’s push to acquire nuclear-powered SSNs reportedly is North Korea’s burgeoning submarine force including new conventionally-powered ballistic missile subs capable of firing the KN11/Pukguksong-1 submarine-launched ballistic missile (SLBM). Nuclear-powered subs, unlike diesel-electric submarines, can stay underwater for prolonged periods of time, which purportedly would allow them to track North Korean boomers more effectively. Yet, how realistic is it that the ROK Navy will operate a small fleet of SSNs? For starters, it is highly unrealistic to assume that the United States will sell or lease nuclear submarines such a Virginia-class or soon to be retired Los Angeles-class SSNs to South Korea for a number of reasons including nuclear proliferation fears, an unwillingness to share sensitive submarine technology with an ally, and the fact that the U.S.-made subs may just be too expensive to operate for the ROK Navy. “The U.S. has never sold its nuclear-powered submarine to a foreign country,” a ROK government official said in September. Consequently, “if we choose to acquire (such subs), it would be in the form of indigenous development.” The ROK Navy would be interested in fielding at least three SSNs to guarantee round-the-clock patrols. Total cost for the acquisition of three subs plus supporting infrastructure could well approach $9 billion excluding operating cost, according to some estimates. According to local media reports, South Korea launched a clandestine military project in 2003 code-named ‘362 initiative’ with the aim of developing an indigenous nuclear sub capability. Yet the program was shut down in 2004 when it became public and was brought to the attention of the International Atomic Energy Agency (IAEA). Before that, however, South Korea’s own atomic energy agency purportedly finished basic design work for a miniaturized nuclear reactor for a new class of SSNs. Various obstacles both political and technical would need to be overcome to fulfill the Moon administration’s dream of a nuclear-powered submarine fleet. A major challenge for any future ROK Navy SSN fleet would be how to secure nuclear fuel. Under a revised U.S.-ROK nuclear deal signed in 2015, Seoul is prohibited from enriching uranium and reprocessing spent-fuel for military purposes, although it does allow enriching uranium for civil nuclear energy in the future. While a SSN could still run on low-enriched uranium, the United States would likely oppose such a move due to nuclear proliferation concerns. “The two countries have yet to review whether or not the revision would allow South Korea to secure uranium necessary for a nuclear submarine,” a ROK defense ministry official told The Korea Times on the condition of anonymity in 2016. South Korea has also ratified the Nuclear Non-Proliferation Treaty (NPT) in 1975 and remains formally committed to it. It would take at least five years for South Korea to build its first nuclear sub even with outside help, according to naval experts. An indigenous SSN program without foreign assistance is unrealistic. Potential international partners could include India, France, and the United States. The Trump administration has so far not publicly endorsed South Korea’s plans to push ahead with the project despite some media reports to the contrary. The military utility of a SSN fleet also remains debatable. The ROK Navy, a force primarily involved in littoral operations, is expected to field 18 diesel-electric attack subs by 2019–all which will be fitted with advanced sonar technology and air-independent propulsion systems. These subs will be able to stay submerged for two weeks or longer. Consequently, additional conventionally-powered subs could also guarantee persistence patrols around North Korean submarine bases. Furthermore, diesel-electric submarines are generally quieter and harder to detect than nuclear boats. They would also be substantially less expensive than SSNs and could therefore be fielded in larger numbers. The ROK Navy could also field other assets besides submarines including anti-submarine warfare aircraft to detect and track North Korean subs. Staggering US N-sub costs.It reminds one of the huge costs of maintaining (only) an N-sub fleet. The cost is that of the Columbia which is an SSBN and something that will be the sole undersea component of the strategic deterrent for many many decades to come. The reason cost is high is because of the size of the sub (>2.5 times the displacement of each Virgnia SSN), the technology, the strategic nature of the mission and the fact that only 12 are to be produced under the program of record and will be bought at a rate of 1 every other year. Now take that and contrast this with the Virginia SSN which has is now being acquired at 2 per year and will be produced well into the 2030s at that rate. The SSN cost actually is competitive with some of the new diesel electric subs out there being sold as new programs to western nations. Columbia cost is still in line with the deterrence mission and the time it is going to serve in that role. Once you factor in the overall cost of the program with it being a 1/3 of the triad, it comes out to be reasonable when you factor in the size of the US budget and economy. BTW, APUC aside the Columbia SSBN estimates for recurring unit costs for sub 2-12 are in the $6 - $6.5 billion range since the first in class sub carries a fair bit of non recurring costs. Overall, the acquisition comes in at roughly $100 Billion including Research and Development and this cost will be spread over nearly 2 decades. That is a pretty small %age of the overall DOD or naval budget to pay for something that assures modernization of a 1/3 of your triad for many decades to come. Yes.Huge costs of SSBNs.I wonder what the actual costs of the Ru Borei class is,the "B" variant to be launched soon.The debate about AIP systems continues.In a conversation with a 3* + gent, we came to the same conclusion that the best AIP system is an N-sub!. turn its P-75I subs into the poor man's equiv of an SSN. We should build as many med. sized SSNs as far as poss., and as many conv./AIP boats which come in at 50/60% of the cost of expensive western/European boats. Our Scorpenes are costwise scandalous- without AIP too.Kilo-2s armed with Shkval and Kalibir far more cost-effective.They're having a ball in the Syrian spat.V.keen to see the Amur/Lada in action. Russia should've sent one to the Meditt. to put it through its paces.Are these subs Baltic specific though? A dozen small, modern (new program with at least some modern R&D) DE submarines that Australia is buying from France cost roughly $40 Billion (way more than what USN pays for its Virginia SSN). Compared to that, a dozen 20,500+ ton nuclear powered strategic ballistic missile carrying vessel @ $100 Billion is pretty much a steal given its value as a deterrent. I wonder what the actual costs of the Ru Borei class is,the "B" variant to be launched soon. There are costs associated with preparing infrastructure to build new vessels and then there are material costs which don't vary drastically by nation. However the largest component, actually paying the designers, workers etc is going to hugely vary given the huge disparity in the economies of the US and Russia. This is why folks look at these things in a relative context as in..what is the cost of a dozen such new submarines to Russia as a fraction of its economy or projected GDP over the time-period vs the same to the US. Like I said, $100 Billion R&D and acquisition spread over 2+ decades is a pretty small amount relative to the US economy and defense spending given what it buys in terms of an undersea component of the triad for the next 4+ decades. Plans are now well advanced for a programme of fixed-wing FOCFTs scheduled to take place from HMS Queen Elizabeth off the US eastern seaboard in the last quarter of 2018. It is expected that a pair of F-35B development aircraft will operate from the ship for two embarked periods, each lasting approximately four weeks. FOCFT test points are intended to define the safe envelope for the operation of the F-35B from Queen Elizabeth and Prince of Wales . Test planning for FOCFT is already well under way across a team of government, navy, and industry stakeholders located on either side of the Atlantic. These stakeholders include the RN, the Ministry of Defence (MoD), Naval Air Systems Command (NAVAIR), the F-35 Integrated Test Force, Lockheed Martin, and BAE Systems. “As a team, we are developing the detailed test points that we need to trial, and where they need to be around the operating envelope that we believe we’re going to be able to release to service,” said David Atkinson, BAE Systems’ aircraft-to-ship integration lead. "We will start from the initial ‘heart’ of the envelope, where we always start testing [and] we will progress out to the edges of the envelope which we need to get to give the maximum capability from the F-35B when operating from Queen Elizabeth. “That has been a progressive piece of work that we started in around 2009, when we laid out the outline plan and what we thought were the aspirational envelopes [based on] the maximum that we could achieve based on our knowledge of the [F-35B] aircraft, from Queen Elizabeth , and what we knew about the [ship’s performance] at sea and the capability to generate wind-over-the-deck. All of those are important parameters in determining the operating envelope." From March through to July 2017, an intensive set of flight simulation trials were conducted to provide evidence which is now being used to underpin what the test envelopes should be for flight trials. “We’re preparing two things. First, we and Lockheed Martin are preparing the flight clearance evidence to NAVAIR, and this will provide a flight clearance recommendation to the MoD for what they believe the envelopes are through which the aircraft should be permitted to conduct flight trials. The MoD will then take that forward through the airworthiness authorities and release a flight test permit to allow those flight tests to occur,” Atkinson said. The detail of each of those areas is being planned within Navy Command by the CSG, Atkinson said. "We are feeding information and evidence to inform that [and] to ensure that we have a complete kit of parts to support the aircraft, and to connect the aircraft from both physical and data points of view." This includes fuelling, electrical power supplies, maintaining the aircraft in the hangar, and extracting data from it. “We’re there to collect flight test evidence. The data extract, and the way the flight test aircraft are configured to allow us to conduct the tests, is critically important." Additionally, the two F-35Bs operating from Queen Elizabeth for FOCFT will both be telemetered back to the ship, so a telemetry system will be temporarily fitted for this purpose. While ski-jump launch and vertical landing envelopes will be prioritised in the test programme, shipborne rolling vertical landings (SRVLs) have also been included in the plan, Atkinson noted. “We have conducted a lot of work on SRVL in the simulator, but we have never flown an SRVL with an F-35 to a real ship before. Airflow and air pattern measurement trials are planned ahead of FOCFT. Lessons identified will be taken into account in the subsequent test progression. “No matter what we predict, when we’re doing flight testing we are always extremely cautious,” said Atkinson. “It’s only what you’ve tested that is real. Everything else is a prediction to help you make good decisions on where to test. The remote detection and tracking of submerged contacts, such as submarines, was demonstrated using an MQ-9 Predator® B Remotely Piloted Aircraft (RPA) during a U.S. Naval exercise on October 12th. General Atomics Aeronautical Systems, Inc. (GA-ASI) participated in this successful demonstration of new maritime patrol capabilities that included anti-submarine warfare.Sonobuoys were deployed by U.S. Navy helicopters and acoustic data gathered from the sonobuoys were used to track underwater targets. The data was transmitted to the MQ-9 and processed onboard, then relayed to the MQ-9’s Ground Control Station (GCS) several hundred miles away from the target area. The event successfully paired sonobuoy receiver, supplied by Ultra Electronics, and data processing technology, provided by General Dynamics Mission Systems-Canada, onboard the MQ-9. A track solution was calculated and transmitted from the aircraft to the Ground Control Station (GCS) via SATCOM. This technology will provide long-range patrol and relay capabilities to the MQ-9 to augment maritime mission sets. Argentina's SAN Juan sub has been missing for 2 days.A massive rescue effort is with help from the US in particular to detect the location of the Sherman built TR-1700t class sub acquire in the late '80s. The missing Argue sub reportedly tried to send 4 sat commons.Either it has suffered a power plant problem or commns. problem.But if it was merely a commons. problem the sub could've surfaced. Time is of the essence if it is in fire straits on the seabed. RN subs could launch drones to deetect enemy ships and subs with a 2.5hr endurance. an Juan’s commander reported problems with the submarine’s batteries and an “electrical fault” on the day the vessel went missing, according to the Argentine navy. On The U.S. Navy reported that two ships searching for the vessel detected noises “sounding like tools being banged against the hull of a submarine,” CNN reported on Nov. 20.The disappearance of the Argentine submarine ARA San Juan and her 44 crew on Nov. 15 is the most serious incident for the country’s armed forces in decades. And one glimmer of hope — a series of satellite signals thought to have been sent from a crew member — turned out to be mistaken.A search and rescue mission involving aircraft and 13 ships from seven countries includes the Argentine destroyer ARA Sarandi, the corvettes ARA Rosales and ARA Drummond, the British ice patrol vessel HMS Protector with Royal Navy submarine rescue specialists, and the offshore patrol vessel HMS Clyde routed from South Georgia. Fearing the worst, the U.S. Navy has sent a submersible rescue chamber, or SRC, which is designed to attach to a stricken submarine as it’s underwater and save the crew.Argentine navy spokesman Enrique Balbi said it’s not known “exactly what happened” to the missing vessel.Possible scenarios include a loss of communications, engine failure or — catastrophically — a fire or explosion.The 216-foot-long diesel-electric San Juan is the second of two TR-1700-class attack submarines German shipbuilder Nordseewerke built for Argentina beginning in the late 1970s. She has a maximum speed of 25 knots submerged and 15 knots on the surface, and possesses 22 torpedoes capable of launching from six 21-inch torpedo tubes located in her bow.She can stay submerged for up to 70 days if close enough to the surface to snorkel, and has enough supplies aboard to last nearly a month. If resting on the sea floor, the crew only have enough oxygen to last several days.San Juan like her sister arrived too late for the Falklands War in 1982. In fact, the construction program hindered the war effort by sending the most experienced Argentine submariners to Europe to assist the TR-1700’s development.San Juan entered service in November 1985. Cragg went on to describe the TR-1700 as “impressive,” noting its 12,000-nautical-mile range and 890-foot maximum depth as representing a “formidable ocean going threat.” During the mid-1980s, U.S. government literature referred to the TR-1700 as the most advanced non-nuclear submarine anywhere in the world. An Argentine submarine missing in the South Atlantic is likely to be running out of air and had reported technical problems before vanishing, naval officials have said. ARA San Juan’s last message reported a short circuit in its batteries and the vessel was ordered to return to its home. The Argentine navy quashed hopes that incomplete satellite calls detected over the weekend could have been from the vessel, but then on Monday night said it was analysing separate "noise" to see if it was the boat. Enrique Balbi, a Navy spokesman, said two of search vessels had detected the sound and called in a US P-8 Poseidon plane to record it with sonobuoys. He later said experts determined the noise did not come from tools being banged against the hull of a submarine as was previously reported by some media. He said it likely came from a "biological" source. ARA San Juan submarine in Buenos Aires. Two oceanographic ships had been dispatched to the site of the sound to send down probes, the spokesman said, adding that the analysis of the captured sound would take some three hours. Buenos Aires had been beginning to face domestic criticism of its handling of the search, with one union describing government efforts as badly coordinated and apathetic. The submarine and its crew of 44 have now been missing for five days as a growing fleet of international vessels and patrol planes brave 20ft waves and high winds to search hundreds of square miles. US Navy submarine rescue chambers have been flown to the region in the hope of bringing the crew to the surface in case the vessel can be found. Gabriel Galeazzi, a spokesman for the Argentine Navy, said the German-built diesel electric vessel had surfaced on Wednesday to report the fault. He suggested the fault could have affected the submarine’s navigation, but said it did have back-up systems. Although the crew has enough food, oxygen and fuel to survive about 90 days on the sea's surface, they only have enough oxygen to last for seven days if submerged. After that, the boat would have to surface or get near the surface to replenish air supply. Seven brief satellite signals lasting only seconds were detected over the weekend, raising hopes the crew were trying to call and prompting jubilation among the waiting families. But analysis of the low frequency signals later found they were not from the submarine. Up to 20 vessels, including the Royal Navy’s HMS Protector and HMS Clyde are joining the search. Britain has also sent an RAF C-130 aircraft and a Voyager refuelling aircraft to help it search for longer. Cdr Erik Reynolds, spokesman for the US Navy, which is coordinating the international effort, said vessels were using their sonar to hunt for the ship, though high waves are hampering efforts. Maritime patrol planes are searching for signs of oil or waste that could have been jettisoned by the crew to signal their location. Two US Navy undersea submarine rescue vessels are on standby if needed for a rescue. The vessels can attach to the hatch of a stricken submarine at depths of up to 2,000ft and then ferry surviving crew back to the surface. "There is no good news," Juan Carlos Mendoza, father of crew member Fernando Mendoza, told local reporters. "Hopefully they have oxygen." The ARA San Juan was inaugurated in 1983, making it the newest of the three submarines in the navy's fleet. Built in Germany, it underwent maintenance in 2008 in Argentina. ATEPSA, a union representing workers in the protection and security of aeronautics, said the case of the submarine "puts centre stage the recurring failures in state policies". It said in a statement that "the apathy in the Services of Search and Rescue, and the lack of coordination which exists in all the public bodies involved, are the faithful reflection of multiple errors which complicate the principle objective: to reach the victims in an urgent manner". The union noted workers in several airports were participating in search operations "despite the problems of communication in the oceanic sector due to lack of investment." This was "aggravated by the fact that the plant that transmits and receives all the aeronautic communications in the country does not have staff," it complained. Remember the battery fire on the INS Sindhuratna? 2 officers were killed.Adm.Joshi resigned immediately afterwards. The fault lay with the MOD for not replacing the batteries in time. As the U.S. Navy fields its largest UAV, Northrop Grumman’s MQ-4C Triton, the service is about to begin development of another, a carrier-based tanker called MQ-25 Stingray. However, this time, Northrop will not be leading the effort. On Oct. 25, the company withdrew from contention, eliminating any hope of its combat-oriented, crank-kite X-47B returning to the carrier deck in one form or another, at least for now. Northrop’s capitulation narrows the field to Boeing, Lockheed Martin and General Atomics Aeronautical Systems. Up for grabs is a multibillion-dollar aircraft development contract and the chance to build up to 72 remotely operated aerial refueling tankers. In an interview with Aviation Week, Naval Air Systems Command (Navair) shrugged off Northrop’s withdrawal as nothing more than a business decision, while noting that there are other fish in the sea. The organization, which procures aircraft for the Navy and Marine Corps, has offered a fixed-price incentive contract for the first four MQ-25 development aircraft. “We’re going to move forward with our strategy,” says Rear Adm. Mark Darrah, program executive officer for unmanned aviation and strike weapons at Navair. “We’ve got a very robust request for proposals [RFP], and feel we’re in a good position with whoever remains behind to give us a proposal.”The Stingray will be the Navy’s first carrier-based platform in recent history developed specifically for aerial tanking. In the past, it has used Douglas A-3 Skywarriors, Grumman A-6 Intruders and even LTV A-7 Corsair IIs at one point, Darrah recalls. These days, the service uses Boeing F/A-18E/F Super Hornets equipped with two 480-gal. auxiliary tanks and a centerline aerial refueling system, or “buddy store.” That’s an inefficient use of combat-rated strike fighters, Navair contends. Darrah says introducing the MQ-25, rather than another surveillance and strike platform, will greatly extend the strike radius of embarked carrier air wings while also freeing the Super Hornets from utilitarian missions. “This makes the air wing more lethal because we’re putting six more strike fighters back into the air that were previously doing organic tanking,” he says. The MQ-25 will not be armed, but future carrier-based UAVs might. It will have an electro-optical/infrared sensor ball as well as space, weight, power and cooling provisions for a potential maritime surveillance radar. Only two key performance parameters matter—carrier integration and mission tanking, says Darrah. To be considered, the proposed aircraft must be capable of offloading 14,000 lb. of fuel starting at 500 mi. from the carrier at sea. The RFP was released Oct. 4, and proposals are due by Jan. 3. Companies, including Northrop, that hold concept refinement contracts will continue that work until about March 2018. A down-selection to one vendor for the aircraft development contract is expected by late summer. The program of record calls for 72 aircraft, capable of operating from Nimitz- or Ford-class carriers. Medium Range Ballistic Missile Target Surrogate (1000+ km range). There were other Ballistic Missile targets launched to validate interoperability between US and European sensors (AEGIS and SMART-L). From pictures and published information, at least 2 of the TBM surrogates can be identified as the Terrier Oriole. During the collective self-defense scenario, the Arleigh Burke-class guided-missile destroyer USS Donald Cook (DDG 75) successfully detected, tracked and intercepted a medium-range ballistic missile target with a Standard Missile-3 Block IB guided missile. Simultaneously, the Spanish frigate SPS Alvaro de Bazan (F101) fired an Evolved SeaSparrow Missile (ESSM) against an incoming anti-ship cruise missile while the Netherlands frigate HNLMS Tromp (F803) fired ESSMs against a pair of incoming anti-ship cruise missiles. This was the first time NATO’s smart defense concept was demonstrated with ships serving as air defense units protecting naval ballistic missile defense units. Following that event, the U.S. Missile Defense Agency and U.S. Navy sailors aboard USS McFaul (DDG 74) successfully test fired a Standard Missile-6 (SM-6). That flight test, designated Standard Missile Controlled Test Vehicle (SM CTV)-03, demonstrated the successful performance of an SM-6 launched from an Aegis Ballistic Missile Defense capable DDG and was conducted as part of the system’s flight certification process. The SM-6 test was not part of the Formidable Shield exercise, but was conducted in coordination with that event to leverage the available range assets. Full of sh*tty dreams, and death, and quit breathing." The woes of its latest class of DDG are well-known,but embarrassing breakdowns like this reflect very poorly upon the quality of British made warships and subs,which in recent times have become something of a joke as far as quality and reliability are concerned. Water entered the snorkel of the Argentine submarine ARA San Juan, causing its battery to short-circuit before it went missing on Nov. 15, a navy spokesman said on Monday as hope dwindled among some families of the 44-member crew.The San Juan had only a seven-day oxygen supply when it lost contact, and a sudden noise was detected that the navy says could have been the implosion of the vessel. Ships with rescue equipment from countries including the United States and Russia were nonetheless rushing to join the search.Before its disappearance, the submarine had been ordered back to its Mar del Plata base after it reported water had entered the vessel through its snorkel, causing a battery short circuit, navy spokesman Enrique Balbi told a news conference.They had to isolate the battery and continue to sail underwater toward Mar del Plata, using another battery," Balbi said.After contact with the San Juan was lost, the Vienna-based Comprehensive Nuclear Test-Ban Treaty Organization, an international body that runs a global network of listening posts designed to check for secret atomic blasts, detected a noise the navy said could have been the submarine's implosion.The search for the 65-meter (213-foot) diesel-electric submarine is concentrated in an area some 430 km (267 miles) off Argentina's southern coast. The effort includes ships and planes manned by 4,000 personnel from 13 countries, including Brazil, Chile and Great Britain. Good info reg. the Zumalt class' extra reqs. for surface strike. The USN and USMC together field 617 F/A-18 Hornets, comprising 95 F/A-18A, 21 F/A-18B, 370 F/A-18C, and 131 F/A-18D aircraft. Having been the subject of numerous upgrades since they were first introduced in the early 1980s, these legacy Hornets are now being extended beyond their 6,000 flight hour airframes lives through to 10,000 hours to help mitigate delays to the F-35C. About 150 Hornets of differing designations have been earmarked for the SLEP, with the aim of keeping them in operational service until 2035. In 2016 it was revealed via a notice posted on the Federal Business Opportunities website that the USN was planning to launch a SLEP for its fleet of Super Hornets also as part of plans to help offset delays with the F-35C. Some of the USN’s approximately 550 F/A-18E/F Super Hornets first entered service in the late 1990s, with the earliest of these having reached the end of their current 6,000-hour service lives in 2017 (some two years before IOC of the F-35C is due in late 2018/early 2019). According to the Naval Air Systems Command (NAVAIR), Boeing will undertake a SLEP of the aircraft’s aft fuselage to extend the service life from the current 6,000 hours to 9,000 hours. No details have been released pertaining to the number of aircraft involved, timelines, or contract values. The delay to the wider F-35 programme and the high operational tempo currently being experienced have caused the USMC to go further than the SLEP, and is actively recovering aircraft from ‘the boneyard’ at Davis-Monthan Air Force Base (AFB) in Arizona in an effort to bridge its capability gap. Under this plan, the corps is recovering, refurbishing, and returning 30 aircraft with extended airframe lives (up to 8,000 hours) and updated avionics. Designated F/A-18C+, these particular Hornets feature the Link 16 datalink; colour screens in the cockpit and navigation upgrades with a moving map display; the incorporation of new Naval Aircrew Common Ejector Seats; and the Joint Helmet-Mounted Cueing System (JHMCS). While much of the USN’s attention is currently focused on the entry-into-service (EIS) of the F-35C, the service is progressing plans to upgrade its current Super Hornet fleet that will operate alongside the JSF. Speaking to Jane’s in mid-2017, Boeing spelled out the Block 3 package of enhancements that the navy is examining as it looks to retain the aircraft out into the 2040s. Known previously as the Super Hornet International Roadmap and then as the Advanced Super Hornet, the Block 3 aircraft is built around a new more powerful processor that is a hundred times more powerful that currently fitted today. The Block 3 features upgrades to the Raytheon AN/APG-79 active electronically scanned array (AESA) radar; an Elbit Systems large area display (LAD) 'glass' cockpit and next-generation avionics; the Block 2 infrared search and track (IRST) system; 'shoulder-mounted' conformal fuel tanks (CFTs); Integrated Defensive Electronic Counter Measures (IDECM); and new General Electric F-414-400 enhanced engines. Further to these enhancements, the Block 3 upgrade will see the airframe hours increased from the baseline 6,000 hours to more than 9,000 hours. The USN has already begun the process of upgrading its Super Hornets to the Block 3 standard, with the first contract being awarded in May 2017. This award was geared at incorporating the Block 2 IRST. Production of Block 3 should begin in fiscal year (FY) 2019, with deliveries to commence in FY 2020. The plan is that all future Super Hornets will be built to this standard, while those aircraft already fielded by the USN will be retrofitted. The USN has reportedly been the least enthusiastic of the US armed forces to be receiving the F-35. Despite all the advantages of stealth, sensor fusion, supercruise, and situational awareness that the F-35C will bring to the navy’s CSWs, it has been said anecdotally that the navy would have preferred to acquire more Super Hornets, at least in the nearterm, until development of the JSF was more fully complete. The navy is set to receive 273 F-35Cs over the life of the programme (340 including the 67 aircraft earmarked for the USMC), with IOC for the service set for August 2018 and February 2019. To date, Strike Fighter Squadron (VFA) 101 'Grim Reapers' and VFA 125 'Rough Raiders' have been stood up as the East and West Coast Fleet Replacement Squadrons respectively, and VFA 147 'Argonauts' will be the first operational fleet unit when it transitions over from the F/A-18E in January 2018. Blending the fifth-generational capabilities of the F-35C with the fourth-generational capabilities of the Super Hornet will be key to the success of the service’s future CAWs, with the official noting: "It's not just about the aircraft, but how that aircraft fits into the wider CSG concept. The F-35 is not being planned as a replacement for the F/A-18E/F [and EA-18G] on the carrier flight deck, but rather as a complementary platform with the capability of the former matching the capacity of the latter through to about 2035. The F-35 will bring a niche capability to strike and suppress heavily defended enemy air defences, and to win in any fight against current fourth- and future fifth-generation enemy fighter aircraft. Integrating the F-35C into the USN is the responsibility of the Naval Air Warfare Development Command (NAWDC), located at Naval Air Station (NAS) Fallon in Nevada. NAWDC will develop the aircraft’s tactics, techniques, and procedures (TTPs) ahead of it being delivered to the CSGs. As noted by the official: “It’s not just about the airplane – we see three questions that NAWDC will have to answer if we are to achieve the maximum potential of the F-35 in the future: Can we achieve dominance in the future; how does fifth-generation fight different; and can the fifth-generation accelerate the [Observe-Orient-Decide-Act] OODA loop? We are aiming to use the machine for the ‘OO’, and the human for the ‘DA’. The F-35’s command-and-control [C2] will be ubiquitous, with a key task to create decision superiority.” As such, NAWDC will have to look at the rules of engagement (RoE) to ensure that they keep up with the technology, given that the F-35C will have the ability to sense and see at much greater ranges, the official said. Can anyone identify this new Iranian Noor anti-ship missile? From the clear pic,its ancestry may be discovered if it has a foster-father. TEHRAN, Dec. 5 (Xinhua) -- A domestically built missile-launching warship formally joined Iran's naval fleet in the Caspian Sea on Tuesday, Press TV reported. The Separ (Shield) warship was delivered to the naval forces during a ceremony in the northern Iranian port city of Bandar-e Anzali. Iranian Defense Minister Brigadier General Amir Hatami described the vessel as the "symbol of peace at sea." The vessel is 47 meters long and 3.9 meters high, and has a cruising speed of 35 knots. The warship is also equipped with different kinds of advanced weapons, including surface-to-surface missile systems, artillery and a fire control radar capable of detecting warships and cruise missiles. Hatami also announced Iran's readiness to expand its defense cooperation with its neighbors, expressing hope that such joint efforts will protect the security of the region and its nations. A very detailed article and update on the DDG-52 FLT III program and the Air and Missile Defense Radar from Jane's Navy International's Chris Cavas (paywall). Posting a portion specific to the SPY-6 / AMDR below. Also of note, Raytheon is also giving a pretty good estimate on where it is in terms of its GaN foundry (and that of its exclusive production partner) in terms of delivery rates for the RF components of these radars. At LRIP for the family they will be delivering 4 AMDR faces (one complete ship set), 4 EASR faces (complete EASR ship set) and 1 EASR lite (1 rotating face) every three years. That's pushing to about 28,000 S-Band GaN T/R modules during the three year period just to support the SPY-6 family and its offshoots in the LRIP phase. Raytheon this year moved the TPY-2 to GaN as well and is also looking to up production for that X band radar from 1 a year to 2 a year to support foreign military sales. With 2 other critically important GaN AESA radar programs currently under execution or competition (both in the C or X band range) it would be interesting to see if they can keep on competing without reaching out to third party suppliers like Lockheed does. Production and supply constraints may explain why Japan's request to include SPY-6 instead of SPY-1 on its AEGIS ashore is facing some push back given the timelines involved. There may be no immediate surplus capacity to support that without some serious cash investment at bringing in additional suppliers or increasing output which may not be sustainable to justify upfront investment. Development of the AN/SPY-6(V) AMDR continues in parallel with work on the DDG 51 Flight III design. A full-scale developmental AMDR installed on the USN’s Pacific Missile Range Facility at Kauai, Hawaii, is in operation, and in September 2017, completed a third straight successful flight test when it simultaneously acquired and tracked multiple threat-representative targets. “The speed, range, trajectory, and complexity of multiple targets proved no match for SPY-6 – it acquired and tracked them all,” Raytheon’s Tad Dickenson, AN/SPY-6(V) programme director, said at the time. Raytheon will be working more with Lockheed Martin in 2018 as the development effort moves to integrate the system into Aegis Baseline 10, the version of the combat system that will initially integrate with the AMDR. Baseline 10 will certify in FY 2023 to support ship delivery, according to NAVSEA. The SPY-6(V) radar is “probably a little heavier” than the SPY-1D radar it is replacing, Dickenson said. As DDG 51 programme manager, Capt Moton is more concerned with weight and power needs than performance, which is handled by NAVSEA’s Integrated Warfare Systems division. Nonetheless, he’s pleased with what he’s seeing from the radar development effort. “Everything I’ve gotten and seen has been that from a performance standpoint the radar is doing incredible things out there. It’s succeeding very well in its missile defence and air defence capability. Russia to stay put at Tartus in Syria,its key naval base in the Meditt. Russian President Vladimir Putin submitted a draft law to the State Duma on the ratification of the Agreement between the Russian Federation and the Syrian Arab Republic about the need to expand the territory of the logistics center in the port of Tartus. In fact, it goes about creating a full-fledged infrastructure for the Mediterranean squadron. Such a base used to exist in the times of the Soviet Union - as counterbalance to the Sixth US Navy. Can Russia build such a naval base again? The agreement will be valid for 49 years. The document is defensive in nature and is not directed against other states. Eleven Russian warships, including nuclear-powered vessels, will be able to stay in the port of Tartus. The agreement can be automatically extended for 25 years. Plots of land, the water area of the port of Tartus, as well as real estate objects will be transferred to Russia for free for the duration of the agreement. The personnel of the base (the text of the agreement indicates it as the "logistics center"), as well as members of crews will enjoy "privileges and immunities." In a nutshell, Russia receives the former naval base of the Syrian Navy in its entirety. Given the terms of the agreement, it would be foolish to refuse from such a great opportunity. Yet, it is not enough to have a base at one's disposal, one needs to maintain it properly. Interfax news agency earlier reported with reference to an informed source that the channel in the port of Tartus would be broadened and deepened. "In the future, two new piers for mooring ships with a displacement of over 10,000 tons will be built along with a complex of residential and administrative buildings for purposes of the Russian Navy," the source then said. Generally speaking, the squadron was recreated in 2013 - in the form of an operational unit of the Russian Navy to the Mediterranean Sea. During the Soviet years, Tartus could not be used as a full-fledged naval base of the Soviet Union. Of course, the Americans did not have such a problem. And of course, the Russian squadron in the Mediterranean can not be on equal footing with the fleets of NATO member states. Is there any sense in the presence of the Russian Navy in the Mediterranean on a permanent basis? Does Russia need to invest heavily in upgrading the naval base in Tartus? "For Russia, a naval base in Syria means the following. First off, it is always a place, where Russian navy men can take a short rest and hold quick repairs, if necessary. Taking into account that the Mediterranean and Black Sea regions are of strategic importance for world security, Russian forces should stay here indefinitely," Mikhail Nenashev, chairman of the All-Russian Fleet Support Movement told Pravda.Ru. In his opinion, there is no need to keep up to a hundred ships in the Mediterranean Sea, as it was in the times of the Soviet Union. "These days, we need efficient ships, we need opportunities when we can solve anti-terrorist tasks with the help of unmanned vehicles, without crew ships," he added. In his opinion, Russia's presence in the region is natural, especially because the Mediterranean is almost like a coastal region for Russia. "The naval base in Tartus is not an act of expansion, especially when Arab countries literally demand Russia's presence in the region for balance," Mikhail Nenashev added. Queen Elizabeth (the CV) is teaking water at 200 litres per hour! 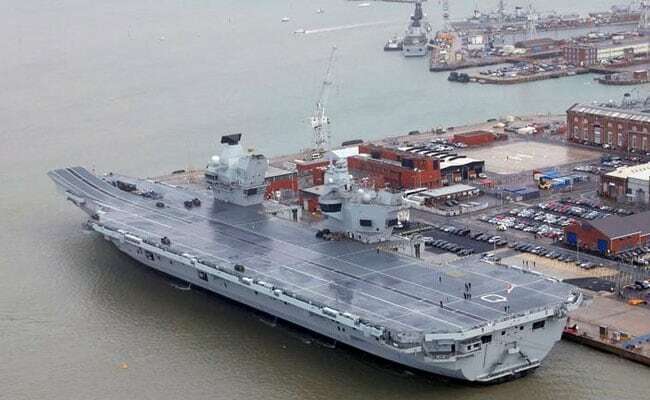 Britain's new aircraft carrier, HMS Queen Elizabeth, is leaking as a result of a faulty seal, it has emerged. The Royal Navy's £3.1 billion warship, which was accepted into the Royal Navy fleet by The Queen less than a month ago, has a "significant" defect. Reports suggested there is a problem with an inflatable rubber ring-style seal around one of the propeller shafts. The fault means the ship has been taking on up to 200 litres of sea water an hour, according to The Sun. The Royal Navy confirmed the problem was identified during sea trials and said the aircraft carrier is scheduled for repair. Repairs, which will be paid for by the manufacturers rather than the Ministry of Defence, are likely to cost millions of pounds, sources suggested. A Royal Navy spokesman said the fault does not prevent the carrier from sailing again early in 2018. At 280m (918ft) long and with an estimated half-a-century working life, the behemoth is the biggest and most powerful ever built by the UK. ..with the shipÕs Captain, Commodore Jerry Kyd (rear right), as she arrives for the commissioning ceremony of Britain's biggest and most powerful warship HMS Queen Elizabeth, into the Royal Navy Fleet at Portsmouth Harbour. Several ship-building yards around the country were involved in the build. the QE2 for its size has a very wide deck - good utility design if it works out. The fact that this brand new behemoth is leaking already is hilarious! How the mighty has fallen. Britannia Rules the Waves — no more? chola wrote: The fact that this brand new behemoth is leaking already is hilarious! How the mighty has fallen. Britannia Rules the Waves — no more? Growing pains are a part and parcel of a first in class vessel, especially one that is this large and complex. This is why you have such a long period between receiving the vessel and sending it out on its first operational deployment. Through 2018 and 2019 they will likely discover similar issues and will have to fix them and move on. Very interesting article from a tech blog on spare parts, budget cutbacks and other issues that have plagued the German navy. Das boot ist kaputt: German navy has zero working subs. 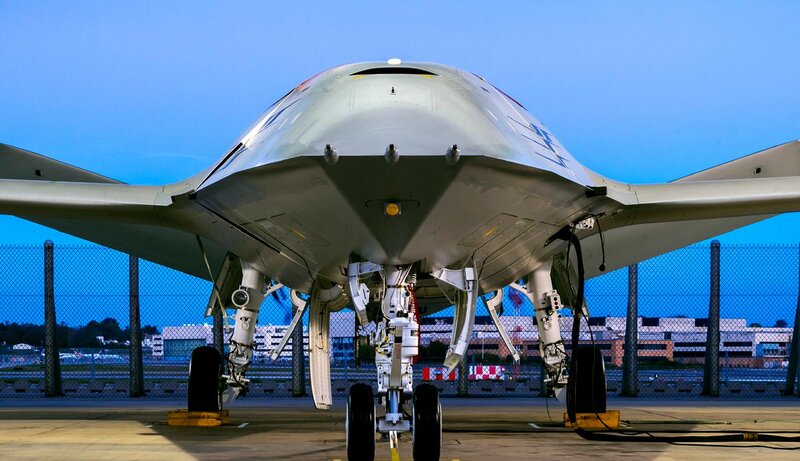 Boeing has revealed a narrow, nose-on view of the company’s bid to win a three-way competition to build the MQ-25 Stingray, a carrier-based unmanned air system (UAS) that the US Navy plans to use as an in-flight refueler to extend the range of manned fighters. The image reveals a design likely derived from a concept that Boeing first developed for the unmanned carrier launched surveillance and strike (UCLASS) programme, which the Navy replaced with the MQ-25 tanker concept. Boeing’s candidate for the MQ-25 will feature a dorsal air intake for a jet engine, conventional wings and large, extremely canted stabilisers. The fuselage cross-section appears wide and somewhat trapezoidal, suggesting ample volume for storing fuel as payload. If a wing fold mechanism for this carrier-based aircraft exists, it appears to lie outboard of the narrow section of the wing revealed in Boeing’s picture.The release image shows the aircraft apparently outside on the flight line at Boeing’s defence base in St. Louis, with a thick power cord plugged into the side of the aircraft and a “remove before flight” streamer dangling from the nose landing gear. The latter feature supports Boeing claim that the aircraft is nearly ready to begin deck handling demonstrations on the ground early next year. The three bidding teams, including General Atomics Aeronautical Systems (GA-ASI) and Lockheed Martin — must submit final proposals for the MQ-25 contract to the navy by 3 June. GA-ASI has already revealed their proposal as a straightforward derivative of the jet-powered Predator C Avenger UAS. Lockheed has reveal a only tiny glimpse of the company’s proposal, showing a refueling pod attached to a small section of a wing. For Boeing, the competition offers a chance to secure a rare opportunity to develop a completely new support aircraft for the US military, as well as gain a programme of record for building a large UAS.